While from a few angles it looks like the Mobilio, there are subtle differences. The exterior design reflects some amount of toughness that you could associate with an SUV. There are projector headlamps and the grille design is different from the Mobilio’s. Silver-finish roof rails are available across variants. The rear gets a connected tail-light design, which makes the BR-V look wider than it is. Its 16-inch wheels and a high ground clearance (210mm) give it the much-needed SUV character.The Honda BR-V exteriors pose a bold and classy image on the road with a solid wing front face and projector headlamps with LED position lamps intelligently designed to give a premium look to the front. The sporty 16-inch alloy wheels, rear combination lamps with LED light guide, front and rear bumper lower garnish, and glossy metallic colour combinations for the body panels leave a long-lasting on-road image. Honda designers work on a philosophy called ‘Man Maximum, Machine Minimum’—they strive to minimise the size of a car’s mechanical components, while making space for occupants as large as possible. The BR-V is 4,456mm long, 1,735mm wide and 1,666mm tall, with a wheelbase of 2,662mm, and an efficient use of space has been made. For example, the second-row seat is a 60:40 split with both slide and recline functions. By pressing a single button, second-row seats can be tumbled forward, making entry and exit for the third row convenient. The third-row seat is a 50:50 spilt (folding type); it can both be reclined and tumbled forward. With third-row seats upright, the boot space is 223 litres; with seats folded, the boot space increases to a huge 691 litres. All three row seats get adjustable headrests. The BR-V, unlike other SUVs, gets a roof-mounted rear AC. The cabin colour theme is all-black, there are silver accents at various places and piano-black gloss finish on the instrument panel. The BR-V shares its dashboard design with the City and the new Amaze; it looks upmarket. The white-lit 3D speedometer with multi-information display is bright and clear. The top-end VX grade gets leather seats, leather-wrapped steering wheel, leather gear knob and leather door armrests. In the manual models, the gear knob, leather or not, is so plain-looking that it doesn’t appear to belong to a premium vehicle such as this. The CVT automatic gear-shift lever, however, looks and feels nice. The drive quality of Honda BR-V is enhanced with electric power steering, and easy accessibility to control lever of acceleration, clutch and brake, assuring stress-free long drives. The strong build quality, tough suspension and the superior quality of interiors offer great comfort to the occupants.Both engines are torquey and, with the new gearbox, make the BR-V an able performer. The initial acceleration may not wow you, but the way it goes from, say, 40kph to 100kph—in the right gear, of course—is exciting. Even though it is a tall vehicle with a high ground clearance, body roll has been contained. The braking system of Honda BR-V features disc brakes at the front and drum brakes at the rear. The ABS with EBD is used as a standard in all variants except the petrol E variant.The body shell is made strong with ACE body structure and front dual airbags are introduced in all variants for complete safety of the occupants.The Honda BR-V is a great handler. Especially the petrol engine. Ride is not too supple and not too stiff and the steering offers right amount of feedback. Throw the BR-V petrol into a corner and you would come out at the other end gracefully. However, this car is in no way meant to do lap times. On the safety front, the BR-V gets ABS and dual front airbags as standard across all variants. This is a good move considering the car priced slightly higher. Available from R8.75 lakh onwards (petrol), R9.99 lakh onwards (diesel) and R11.99 CVT, the BR-V has been smartly priced—neatly slotted between the Creta and the Duster. 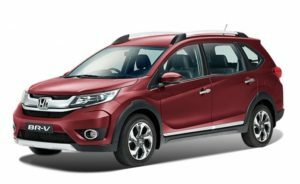 It has some features of an SUV, drives like a sedan and seats seven people like an MPV … essentially, the BR-V is as good as a crossover car can be. It arrives at a time when ever more buyers are seeking an affordable and good looking crossover. We hope it finds itself a sweet spot.